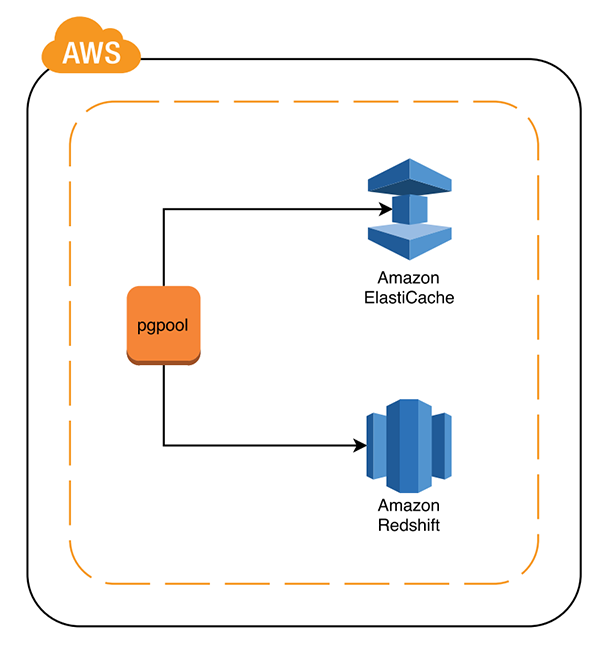 In this blog post, we’ll use a real customer scenario to show you how to create a caching layer in front of Amazon Redshift using pgpool and Amazon ElastiCache. Almost every application, no matter how simple, uses some kind of database. With SQL queries pervasive, a lack of coordination between end users or applications can sometimes result in redundant executions. This redundancy wastes resources that could be allocated to other tasks. For example, BI tools and applications consuming data from Amazon Redshift are likely to issue common queries. You can cache some of them to improve the end-user experience and reduce contention in the database. In fact, when you use good data modeling and classification policies, you can even save some money by reducing your cluster size. In computing, a cache is a hardware or software component that stores data so future requests for that data can be served faster. The data stored in a cache might be the result of an earlier computation or the duplicate of data stored elsewhere. A cache hit occurs when the requested data is found in a cache; a cache miss occurs when it is not. Cache hits are served by reading data from the cache, which is faster than recomputing a result or reading from a slower data store. The more requests served from the cache, the faster the system performs. In a clinical analysis laboratory, a small team of 6 to 10 scientists (geneticists, doctors, and biologists) query around 2 million lines of genetic code looking for specific genetic modifications. The genes next to a modified gene are also of interest because they can confirm a disease or disorder. The scientists simultaneously analyze one DNA sample and then hold a meeting to discuss their findings and reach a conclusion. A Node.js web application contains the logic; it issues the queries against Amazon Redshift. 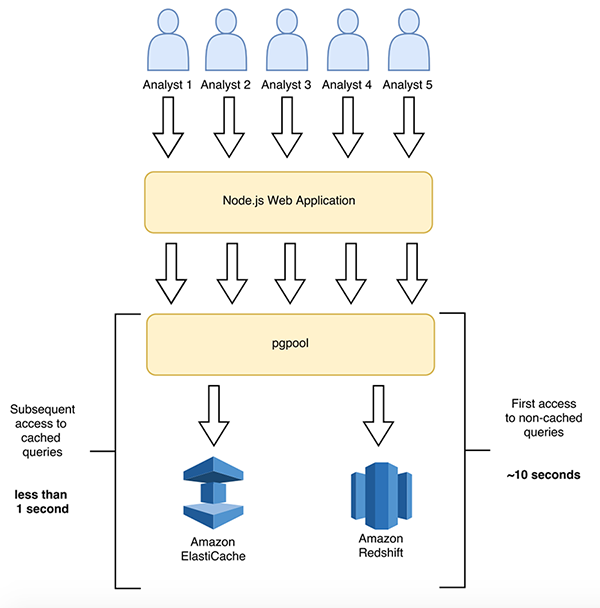 Using the web application connected to Amazon Redshift, the team of scientists experienced latencies of around 10 seconds. When the architecture is modified to use pgpool, these scientists were able to return the same queries in less than 1 second (in other words, 10 times faster). Pgpool is software that sits between your database clients and your database server(s). It acts as a reverse proxy, receiving connections from clients and forwarding them to the database servers. Originally written for PostgreSQL, pgpool has other interesting features besides caching: connection pooling, replication, load balancing, and queueing exceeding connections. Although we didn’t explore these features, we suspect they can be used with Amazon Redshift due to the compatibility between PostgreSQL and Amazon Redshift. Pgpool can run in an Amazon EC2 instance or in your on-premises environment. For example, you might have a single EC2 instance for dev and test and a fleet of EC2 instances with Elastic Load Balancing and Auto Scaling in production. The clinical analysis laboratory in our use case used the Psql (command line) and Node.js application to issue queries against Amazon Redshift and it worked as expected. However, we strongly recommend that you test pgpool with your PostgreSQL client before making any changes to your architecture. This is the default method if you set up the cache and make no changes. It’s slightly faster than Memcached and is easier to configure and maintain. On the other hand, in high-availability scenarios, you tend to waste memory and some database processing, because you cache the query per server and process the query for caching at least once for each server. For example, in a pgpool cluster with four servers, if you expect to have a 20 GB cache, you must provision 4 x m3.xlarge instances and pay four times the cache. Each query must be processed by the database at least four times to be cached in each server. In this method, the cache is maintained externally from the server. The advantage is that the caching storage layer (Memcached) is decoupled from the cache processing layer (pgpool). This means you won’t waste server memory and database processing time because the queries are processed only and cached externally in Memcached. You can run Memcached anywhere, but we suggest you use Amazon ElastiCache with Memcached. Amazon ElastiCache detects and replaces failed nodes automatically, thereby reducing the overhead associated with self-managed infrastructures. It provides a resilient system that mitigates the risk of overloaded databases, which slows website and application load times. For the steps in this post, we will use the AWS Command Line Interface (AWS CLI). If you want to use your Mac, Linux, or Microsoft Windows machine to follow along, make sure you have installed the AWS CLI installed. To learn how, see Installing the AWS Command Line Interface. The IMAGEID variable is set to use an Amazon Linux AMI from the US East (N. Virginia) region. Set the KEYNAME variable to the name of the EC2 key pair you will use. This key pair must have been created in the US East (N. Virginia) region. If you will use a region other than US East (N. Virginia), update IMAGEID and KEYNAME accordingly. Set backend_hostname0 to the endpoint address of your Amazon Redshift cluster. Set memqcache_memcached_host to your Elasticache endpoint address. Set memqcache_memcached_port to your Elasticache endpoint port. Now that pgpool is running, we will configure our Amazon Redshift client to point to the pgpool endpoint instead of the Amazon Redshift cluster endpoint. To get the endpoint address, you can use the console or the CLI to retrieve the public IP address of the EC2 instance or you can just print the value we stored in the $INSTANCEIP variable. The first line in the log shows that the query is running directly on the Amazon Redshift cluster, so this is a cache miss. Executing the query against the database, it took 6814.595 ms to return the results. As the first two lines of the log show, now we are retrieving the results from the cache with the desired result, so this is a cache hit. The difference is huge: The query took only 247.719 ms. In other words, it’s running 30 times faster than in the previous scenario. Pgpool uses your SELECT query as the key for the fetched results. By default, memqcache_auto_cache_invalidation is set to on. When you update a table in Amazon Redshift, the cache in pgpool is invalidated. memqcache_expire defines, in seconds, how long a result should stay in the cache. The default value is 0, which means infinite. Comma-separated list of tables that should be cached. Regular expressions are accepted. Comma-separated list of tables that should not be cached. Regular expressions are accepted. If you specify the comment /* NO QUERY CACHE */ in your query, the query ignores pgpool cache and fetches the result from the database. If pgpool doesn’t reach the cache due to name resolution or routing issues, for example, it falls back to the database endpoint and doesn’t use any cache. 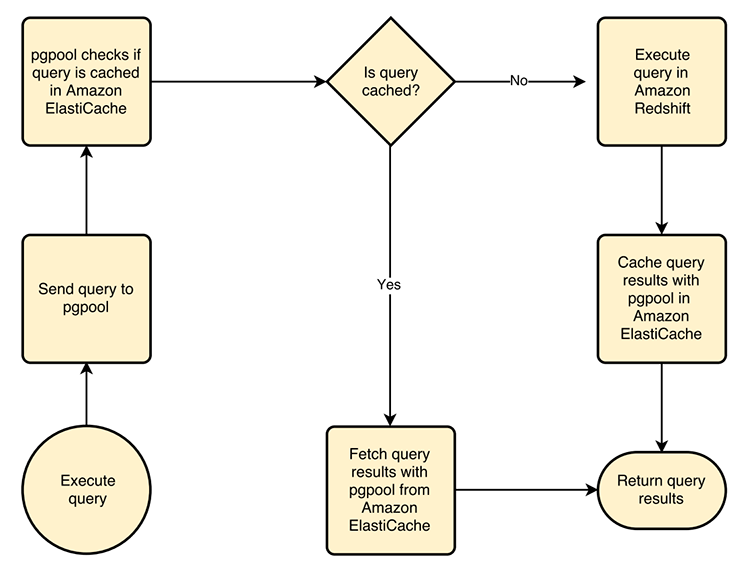 It is easy to implement a caching solution using pgpool with Amazon Redshift and Amazon Elasticache. This solution significantly improves the end-user experience and alleviate the load on your cluster by orders of magnitude. This post shows just one example of how pgpool and this caching architecture can help you. To learn more about the pgpool caching feature, see the pgpool documentation here and here. Happy querying (and caching, of course). If you have questions or suggestions, please leave a comment below.